This 3 hour event is intended as a low cost introductory event for primary and secondary schools. The event has also been offered as part of the BBC’s family learning scheme and as a family learning session at adult education colleges around the country. 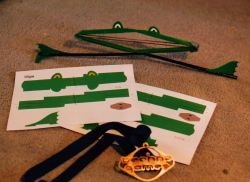 Up to 8 groups of 4 children work as teams, using cutting and sticking skills to turn a pre-printed card kit and a few sheets of A4 paper into a ‘wide- mouthed frog’ capable of jumps in excess of 1m. The frogs are ‘jumped’ in front of a calibrated screen to give the excitement of a real competition, and if time allows then additional rounds are held to give children the opportunity to experiment to improve their jump heights. Teacher’s notes can be provided to help link the teamwork, materials, structures and energy elements of the event into the curriculum, and A- level students can always calculate the efficiency and track the energy losses!